Central low-grade osteosarcoma with an unusual localization in the diaphysis of a 12-year old patient. 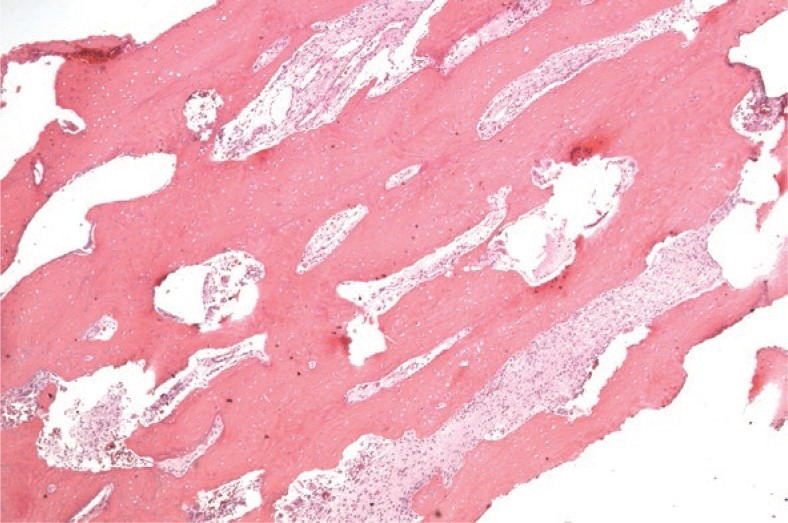 Low-grade central osteosarcoma is a very rare subtype of osteosarcoma with a predilection for the metaphysis of long bones and a peak incidence in the 3(rd) decade of life. Absence of specific clinical symptoms and a good prognosis after wide resection are the characteristics of this entity. Chemotherapy is not indicated in this highly differentiated tumour. A 12-year old girl was referred to an orthopaedic tumour centre due to the increasing pain in the left diaphyseal femur when walking. The pain started 3 days prior to the presentation and did not persist at night or at rest. Additionally the patient herself detected a mass in the left femur. The clinical examination revealed a visible and palpable swelling of the femur. On exertion of pressure it was painful. The surrounding skin and the remaining examination were normal. There was no history of weight loss, fever, chills, fatigue or exhaustion. The patient had no relevant past medical history. Routine laboratory tests were within normal range. 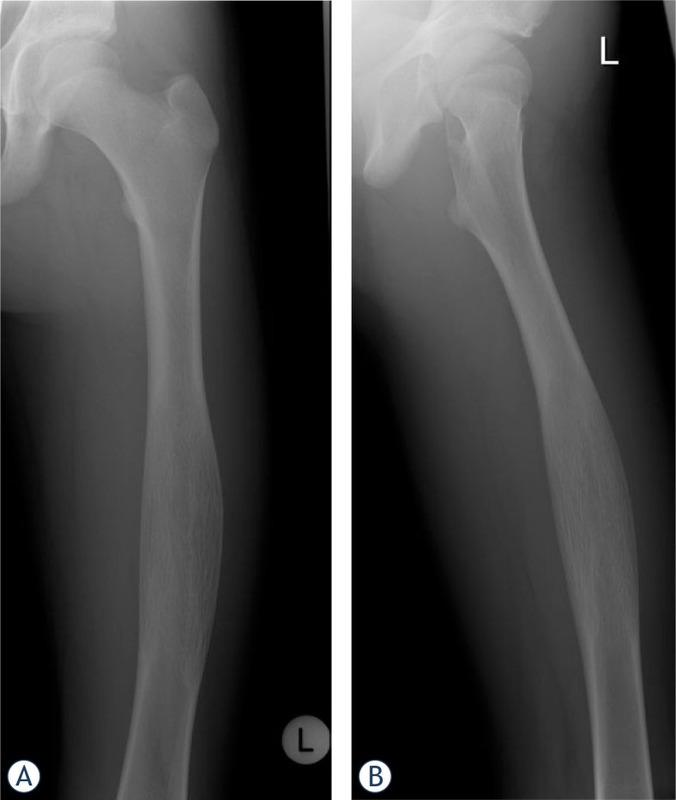 Radiography showed an osseous expansion with lamellated periosteal reaction in the diaphysis of the left femur (Figure 1A, B). The MR scan showed in T1-weighed imaging in the mid of the left femur with contrast medium enhancement, lesion in the mid of the left femur. Cortical destruction was present. The size of the lesion was 12 cm (cranio-caudal) × 3,5 cm (sagittal) × 4 cm (transversal) (Figure 2A). Whole body bone scan showed the increased uptake of the tracer in the diaphysis of the left femur, but no evidence of further lesions (Figure 2B). Staging was negative. Radiological differential diagnoses included fibrous dysplasia, Ewing’s sarcoma and chronic osteomyelitis. Incisional biopsy was conducted from the lateral side. The biopsy specimen showed a hypocellular spindle-cell proliferation arranged in fascicles with mild cytologic atypia and only single mitotic figures. The tumour proliferation permeated surrounding bone structures and entrapped bony trabeculae (Figure 3A, B) Diagnosis of a low-grade central osteosarcoma of the diaphysis was made. FINGURE 1A,B X-ray shows a 12 cm intraosseous expansion and lamellated periosteal reaction in the diaphysis of the left femur (anterio-posterior, lateral). FIGURE 2A T1 weighed MR imaging detects a hyperintense, contrast medium enhanced, lesion in the mid of the left femur. Cortical destruction can be seen. The biopsy tract can be seen on the lateral side. FIGURE 2B Whole body bone scan showed increased uptake of the tracer in the diaphysis of the left femur (Tc-99m-3 phases bone scintigraphy). FIGURE 3A The tumour is composed of a well differentiated fibroblastic component entrapping bony trabeculae. 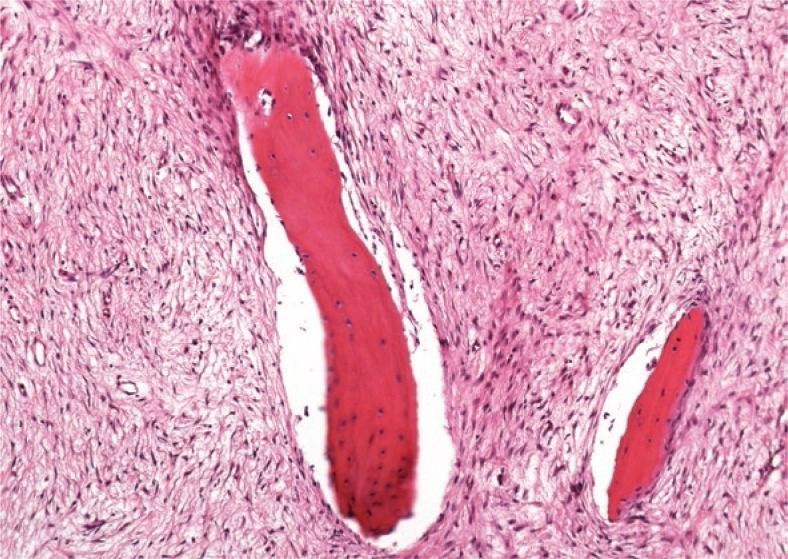 The spindle cells are set in a collagenous matrix (H&E stain). FIGURE 3B On low power magnification long parallel seams of bone are surrounded by a hypocellular spindle cell stroma (H&E stain). FIGURE 4 The X- ray shows the reconstruction of the femur with a vascularized fibula, a homologous allograft and a plate (11 months postoperatively). Considering the patient’s age and the diaphyseal location in the presented case, these features are very uncommon within an already extremely rare tumour entity. A constellation like this makes it difficult to obtain a correct diagnosis, which can only be achieved by a multidisciplinary approach, including radiology, pathology and orthopaedics. When misdiagnosed or mistreated the patient is set at risk to develop high-grade osteosarcoma and metastasis. Unnecessary exposition to chemo- or radiotherapy has to be avoided. Therefore, one should be aware of this rare subtype of osteosarcoma and LGCOS should be considered as a differential diagnosis.